Culture Camp is a one-day workshop led by cultural anthropologist Grant McCracken. I have never had interns before. In fact, I thought there was something wrong with using them. But I now have two. It occurred to me that there might be people out there who would like to act as virtual interns, to follow along at home, as it were. So this letter is to you, too. While we wait for your internships to begin in earnest, I thought I would suggest a couple of things we can do in the meantime. When you are reading NYT, WSJ, blogs, aggregators, etc., please listen for that small note of surprise that heralds something that doesn’t quite fit. Something on the page or the screen that has caught you by surprise. The second step is to ask whether it is something or nothing. It’s nothing if it is a “floater,” as it were, a mote in the eye, an artifact of language or logic, but not something in the world. And it’s also “nothing” (for our purposes) if there is some easy, obvious explanation. It’s something if on closer scrutiny it resists, defies our categories of explanation. The natural explanation here is to dismiss. If something doesn’t conform to our categories, it can’t be the category’s fault. The datum is wrong. But of course this is the beginning for insight. What would you have to think to make this something make sense, how would you have to change your explanatory models? There is lots of stuff pouring around out there. I found this in the WSJ the other day. This is what Marc Andreessen calls ‘software eating the world.’ Amazon consuming high street and the mall. An easy explanation then. The thing that struck me was the acceleration. See the data for 2017. The “why” is not mysterious but the “now what?” is. 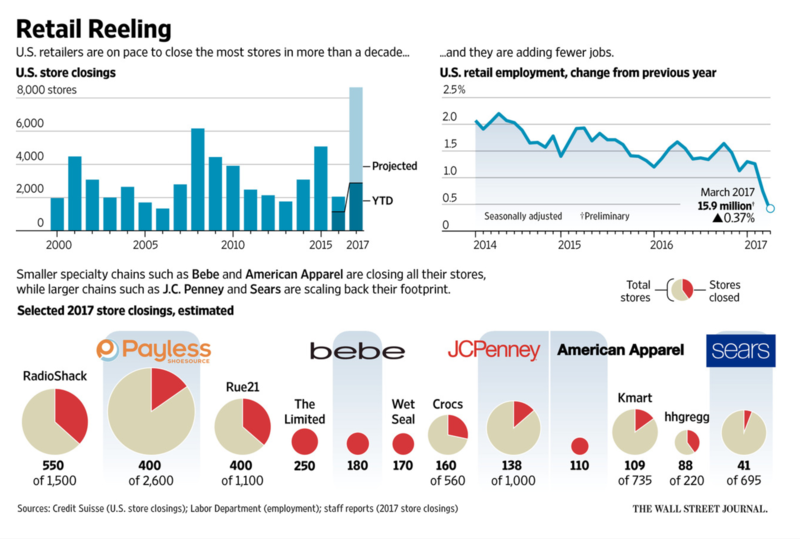 What does the world look like when retail vanishes more and more from the bricks and mortar world? I realize I haven’t really thought about this. I have no obvious answers, no particular way of thinking about the problem. All I (now) know is that it approaches at speed…and I’m not ready. Retail Reeling is not a perfect example of pure surprise, then. Marc Andreessen put us on notice years ago. But it is a chance to discover that my explanatory models, the sense making apparatus in my head, are not a reliable guide to the world in the works. I’m not ready for what happens to culture and the world once software eats them both. Here’s something that’s, for me, weirder. I was at a media conference last week. (Thank you, Jacob Groshek for including me in the very interesting Streaming Television and Second Screening Workshop at Boston University.) I came upon a reference to Superwholock. 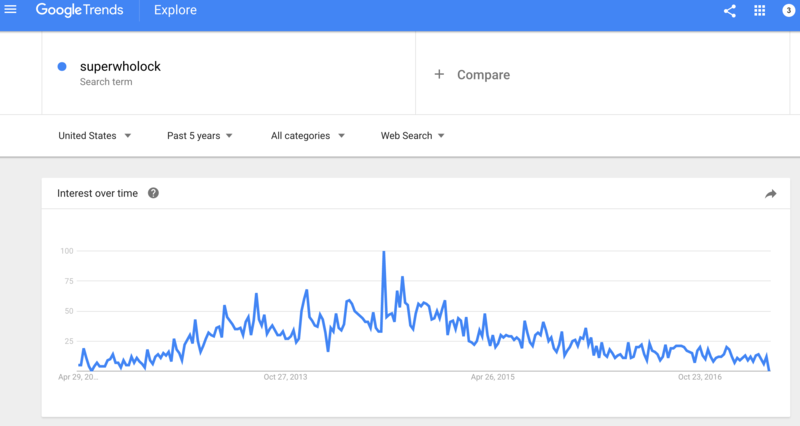 I checked Google trend to see where it stands in terms of popularity. Gliding gently into obscurity by the look of things. Lots of little questions: why was it invented in the first place? Why did it peak several years ago? Why is it now on the decline? The categories that activate for me when I look at this are chiefly to do with fanfic. This is a fantastically interesting development, and one measure of the extent to which we are shifting from passive media consumption to something more Jenkensian: an inclination to appropriate and reinvent. But there are more interesting and particular things to mine from the meme. Have a go at it (or any other meme). That’s always the game here at cultureby.com. What’s happening “out there?” What are the first signals, the earliest indicators that something has changed? What can it tell us about what is happening “in culture.” And what does that tell us about who and what we are becoming as a world and culture (not always the same thing but always interacting ferociously)? This turns out to be a long note, and with your permission, Jarvis and Donte, I will put it on line at cultureby.com. There may be people who want to act as virtual interns…or real ones for that matter. Craft fatigue / Artisanal exhaustion?